Notre Dame Cathedral, built during French Colonial Years. Vietnam has more than 6 million Catholics. I return another day to walk the best preserved section of Dong Khoi. Once known as the Place Garnier, it's now called Lam Son Square, where I step into the Caravelle, one of the most luxurious historical hotels in town. This was a favorite of the international press corps based in Saigon during wartime. NBC, CBS, and ABC had their Saigon bureaus in the Caravelle. From here their offices sent out television crews that covered battlefields all over South Vietnam. This old hotel became the headquarters of the world’s first TV war. A who’s-who of America’s top journalists made the Caravelle their Saigon residence. Legend Walter Cronkite stayed here, as well as Pulitzer prize winners David Halberstam and Peter Arnett. Vice President Richard Nixon slept here, as did President Bill Clinton, who finally re-established America’s diplomatic relations with Vietnam. Taking the elevator to the tenth floor, I step into what is now the Saigon-Saigon Bar. I grab a table with a view, order a Tiger beer, and check out the scene. As traffic buzzes below, I peer out across the rooftops of the teeming city center. Down at the end of Dong Khoi, the dual spires of the Notre Dame Cathedral reach for the heavens. The 19th century neo-Romanesque building was once the tallest in the city. It has since been dwarfed by other buildings, as skyscrapers begin to dominate the skyline. Nearby expat bar 'The Office'. No hanky-panky with the waitresses. How about a nice game of darts?? With such a commanding view of the city, this rooftop bar became a journalist’s favorite, as a place to drink and trade information. In his famous book “Dispatches” Michael Herr wrote about the fall of Saigon as viewed from this bar, known then as ‘Jerome and Juliette’s’. During the various times of violence in Saigon, whether it was a coup, or the Tet Offensive, or the fall of Saigon, some members of the foreign press corps gathered up in this top floor bar. From their high panoramic vantage point, they’d look down and watch the fighting around the city, holding a cocktail in hand. Some correspondents claimed that they could cover the war solely from this bar, without ever leaving their bar stools. When the final offensive came, the few die hard journalists still up here watched as American helicopters evacuated westerners and refugees from Saigon. A few blocks down Dong Khoi, a Huey landed on a rooftop, making the final flight to bring out refugees. With so many refugees on the roof, most were left behind. A UPI photographer captured the dramatic moment on film. Although the building was an apartment house for CIA employees, an editor misidentified the location as the US embassy. The photo with its errant caption appeared in newspapers around the world, and it became the most iconic image of the war’s end. I’m reminded that even with a free press, the truth doesn’t always come out. With so much conflict around Saigon, there was only one attack on this hotel, a bombing in 1964. A few people were injured, but nobody was killed. Since the bombing occurred near mid-day, all the journalists were out on assignment. By the war’s later years, the Viet Cong may have decided that the foreign journalists were a benefit to their cause, and left the Caravelle alone. In 1975 the government took over the hotel, and renamed it the Doc Lap (Independence) Hotel, only to change it back to the Caravelle later. 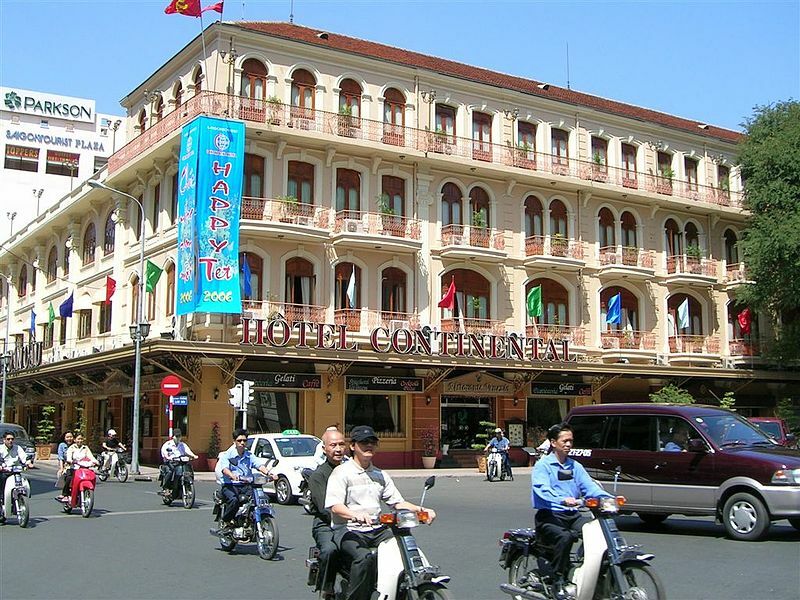 Looking across the square is one of Vietnam’s most romantic locales, the 19th century Hotel Continental Saigon. Room 214 had a famed long term resident, the author Graham Greene. His stay here during the 1950’s was a time when the French empire was declining, and American influence here was rising. Here Greene wrote the novel ‘The Quiet American’, about the intrigues of the time. The book became a movie in 1958, and was remade on location here in 2002 starring Michael Caine and Brendan Frasier. Just across the square, the production filmed a a terrorist bombing scene outside the Continental. Now foreigners were shooting film here, instead of bullets. This was groundbreaking; the first western studio production to film within Vietnam since the war’s end. After the communist takeover, the Continental became the Dong Khoi Hotel, before reclaiming its colonial name. Both the Caravelle and the Continental have gone through extensive renovations, and both had their boomerang name changes. With the economic liberalization of the south, some of the neighborhood’s old names are coming back. The Vietnamese government finally figured out that nostalgia can be very profitable. 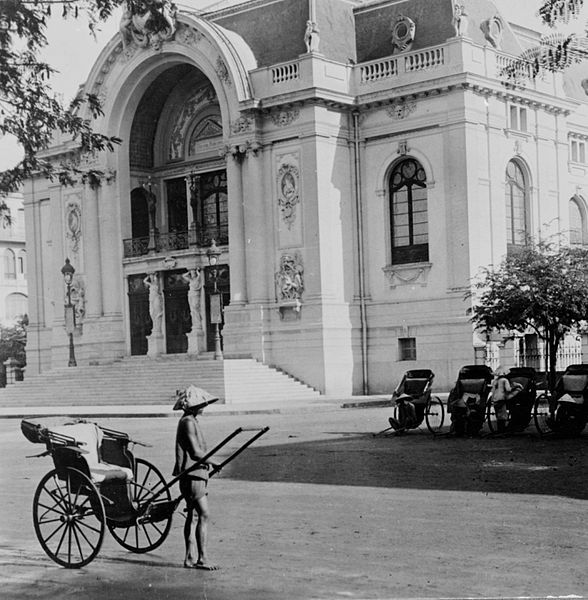 Between the two famous hotels, is the Saigon Opera House. Built by the French it later was the National Assembly, before becoming the Municipal Theater in post-war days. It’s a picturesque vision of French architecture, save for the bar now open in the basement. The neon lights and girlie bars are long gone from this old street, but Dong Khoi continues to be a focus of controversy. In 2008, as the Olympic torch passed through town on its way to Beijing, a small group of Vietnamese men gathered on the front steps of the theater. They held up signs in Vietnamese, English and Chinese, demonstrating against Chinese foreign policy. They were soon arrested. A well known rights activist among them was later sentenced to 30 months in prison. That non-violent demonstration at the municipal theater was tame, compared to a more outrageous act of free speech from the previous decade. Back in 1993, an ex-ARVN Major and an accomplice hijacked a flight out of Tan Son Nhat Airport. The former soldier didn’t make any demands, other than to order the pilot to circle the city. He then threw anti-government leaflets out of the plane, scattering them across HCMC. He attempted to escape by parachuting out of the plane, but the police caught him anyway. He was sentenced to 20 years in prison. D.B. Cooper would have been proud. INTRODUCTION: WHY ON EARTH GO TO SOUTHEAST ASIA?